Feel Bach! flower remedies blog: Are You Missing the Fun in Life? Are You Missing the Fun in Life? Are you missing the fun? Are you so convinced that life is bad that you can't really have a good time, even when friends and family bend over backward to please you? If so, you're suffering from a negative Gentian state. Sometimes this state comes about as the result of circumstances. In today's environment, it could very well be unemployment that has you down. And you probably get mad if a spouse says "For heaven's sake, this isn't the end of the world. We're going to get through this. And all of life isn't gloomy. Look at the love your family gives you. Can't you at least appreciate and enjoy that?" People in a severely negative Gentian state do NOT want to hear about what's good. They're stuck on what's bad. 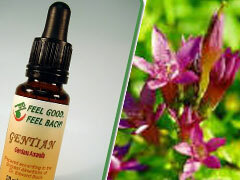 The negative Gentian state can also be the result of illness, or the loss of a loved one. Children who are unhappy in school often fall into this state, as do elderly people who are forced to move to a care facility. Whatever the cause, the result is misery. Not just for the person in the negative state – for their whole family. They just keep trying to find a way to make the sufferer smile - and being rebuffed. It is no fun at all. So if you're missing the fun - or if someone you love is missing the fun – get a bottle of the Bach Flower Essence Gentian and get on the road to recovery. When I was missing a lot of the good things in life, it turned out that I was suffering through a period of depression. Depression can be extremely difficult to deal with,and without the proper support it becomes that much tougher. Keep an eye out for the signs and symptoms of depression, just in case a friend or loved one needs your help.